National bestselling author Robin Wells weaves a moving epic that stretches from modern-day Louisiana to World War II-era New Orleans and back again in this multi-generational tale of love, loss and redemption. 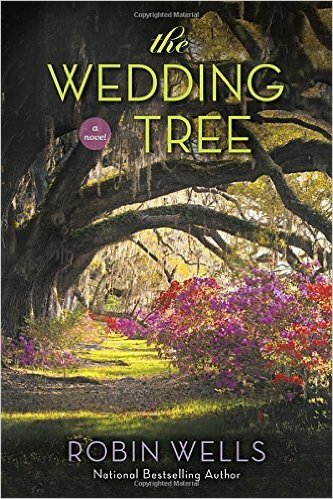 Hope Stevens thinks Wedding Tree, Louisiana, will be the perfect place to sort out her life and all the mistakes she’s made. Plus, it will give her the chance to help her free-spirited grandmother, Adelaide, sort through her things before moving into assisted living. Spending the summer in the quaint town, Hope begins to discover that Adelaide has made some mistakes of her own. And as they go through her belongings, her grandmother recalls the wartime romance that left her torn between two men and haunted by a bone-chilling secret. Now she wants Hope’s help in uncovering the truth before it’s too late. Filled with colorful characters, The Wedding Tree is an emotionally riveting story about passion, shattered dreams, unexpected renewal and forgiveness—not only for others, but for ourselves. A beautiful story surrounded by a cover just as beautiful. Yes, I definitely loved this novel. It drew me in immediately and I could not help but be fascinated with the characters. The setting is the town of Wedding Tree, a small town in Louisiana. Hope's grandmother has lived there for many years, but she is starting to suffer from a touch of dementia. The large home is no longer safe for her, so Hope arrives to help her pack up and move to California to be with the rest of her family. Slowly, with all the items that need to be sold or donated, memories return to fill grandmother's mind. Secrets she has kept long buried resurface and she begins to share them with Hope. Hope is also at a cross-roads in her life. The time she is spending with her grandmother leads her to Matt, a widower with two wonderful children and an ex-sister-in-law bent on marrying her dead sister's husband. Sweet and moving, this is a novel about loss and and finding love and meaning in one's life again. The endearing characters had me believing every word. I enjoyed how seamlessly the past and the future joined together. And there was an incredibly satisfying ending too. I loved this "FEEL GOOD" book and highly recommend it!